Oh. Another new day. Another new year. Thanks to Pope Gregory XIII for introducing the new calendar system that even made us more bemused. Seriously. Human is the only creature that counts the second and the day and the year of time. And when the climate and weather shift, we all are confused again (How come it's 11 degrees Celsius in December here in Germany? and so on). Anyway. If I use the Gregorian calendar, then our year of 2013 will be ending soon. Some people hate #throwback (oh god I can't believe I put hashtag), but for me, a sweet little remembrance of what I've experienced in the past year shows how much life has given me. So, in the matter of what I'm writing here, which is mostly about fashion, I have achieved a full annual circle of the Paris fashion week, which started back in January, during couture week no less. And from the snow blizzard to the summer breeze during fashion week, I have seen the most creative and craziest people in the industry. I have been welcomed, taught, nurtured, and guided by all of them. And most importantly, I conjointly have been inspired by them. Being novitiate writer in fashion (compared to those who have been doing this for decades, I'm still nada) , I realize that 2013 was fat of lessons. It promulgated and gave and birth to new designers and editors, selfie becomes the word of the year, and I never feel more energetic and excited to keep learning and improving. Below, in no particular order, I'll share with you, ten most wonderful humdingers of fashion, my favourites, along with quotes and the looks of their particular collections, collections which were done con amore, pertaining designs that shows passion, hardihood, insanity, creativity, and love. Note: I only include designers whose shows I have attended. "Patience and passion above all else". 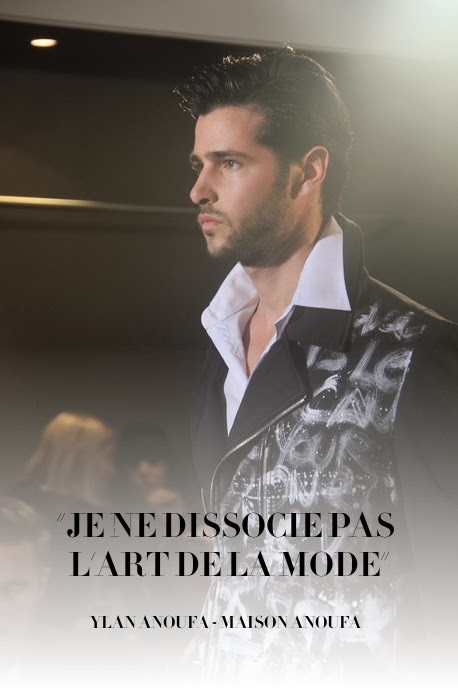 Franck Sorbier has showed me, that quality, dedication, passion, depth of research and immense techniques are the core of, not only fashion, but everything. It is not always an easy task to do, fashion. That coat, with a pattern of folklore creatures, created a look that awakens me more than anything I've seen before. The romance, the strength, and yet at the same time, fragility. The concept of metamorphose, is so deep that if we all see, it's that life is all about; ever changing, ever growing, ever improving, all to the better. 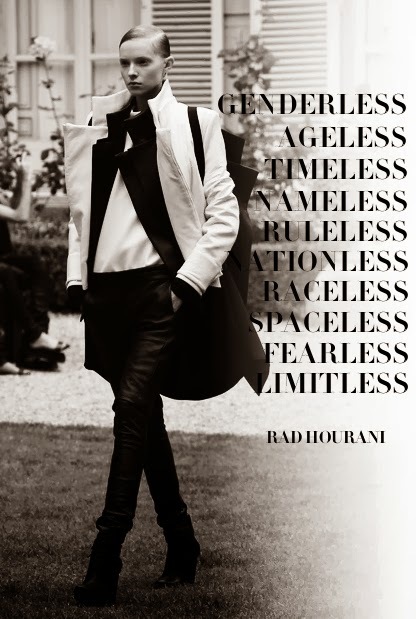 As the first and to-date the only unisex couturier, there's no doubt that Rad Hourani has more than fashion to offer. His thorough thoughts and views about life, gender, love, art (without leaving anything else behind), are something more suitably in a possession of a philosopher. His idea of world without any form of barrier, his force and effort to eradicate the limit to the furthest possible of gender paradigm, his open-mindedness and free-spirited idealism, all make him one of the most thoughtful and brilliant fashion people I have talked to. The one that I called as THE king of elegant dressing was he. His passion in architecture and art (art genes flow in the entire Rolland family), his refusal to have 'muse', as a justification that inspiration and purpose of a dress should come from anything and not limited to only from one woman, his effort to make his clothes as comfortable as possible (I love this one), vastly make Stéphane Rolland, well, prodigious. His collection of wearable and accessible couture has made Indonesia bursting of pride. 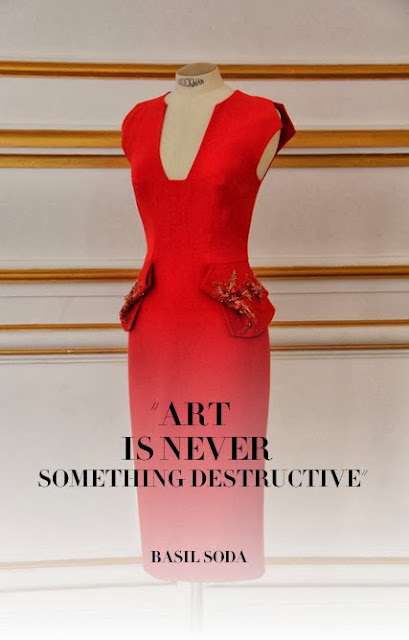 He creates fantastic couture but still keeping the feet on the ground; couture with a lucrative sensibility, young, modern, and yet very deeply in touch with cultural essence. His idea of her clientèle that "she might be wearing couture going for a coffee with a friend or going to the beach wearing a simple tank top and short", is nothing but a brave embrace of reality. Without leaving the dignified craftsmanship and meticulous attention to detail, he corroborates the most important thing in fashion; that fashion is about today. Fashion is now. If I have to pick one designer with a strong and determined concept of a collection, then, no brainer, he is the one. The idea, the inspiration he absorbs and the way he interprets it in garment construction, is just marvellous. I remember the first time I attended his shows, where I was in standing section, in a vantage point for observing the details of his clothes with just a mere foot away from the models down on the runway, I could see every little piece of fabrics constructed in such a way resembling fish scales. It was magnificent, every inch of it. It was attested, that his creativity is getting more mature for the second one. Eagle Eye, the theme for the second collection, is just perfect to describe what he possesses, the ability to see beyond, and to act with exceptional precision. Oh. The wonder kid of couture. This Indonesian designer, who showed his début collection for ready-to-wear in Paris for spring collection, has more ideas than a school of design combined together. 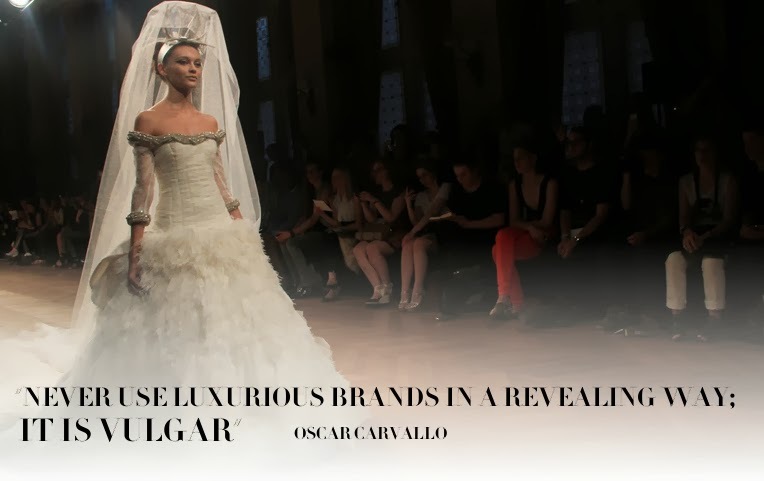 His age can fool you, because what he showed for couture collection is nothing but magnificent. His step to show in Paris is just righteous, since Paris is the place where he belongs. With his out of box--if there's any--creativity and craftsmanship, his ground-breaking ideas that made Lady Gaga, Kim Kardashian, and The Hunger Games' costume designer wonder-stricken, Tex is definitely one to watch. 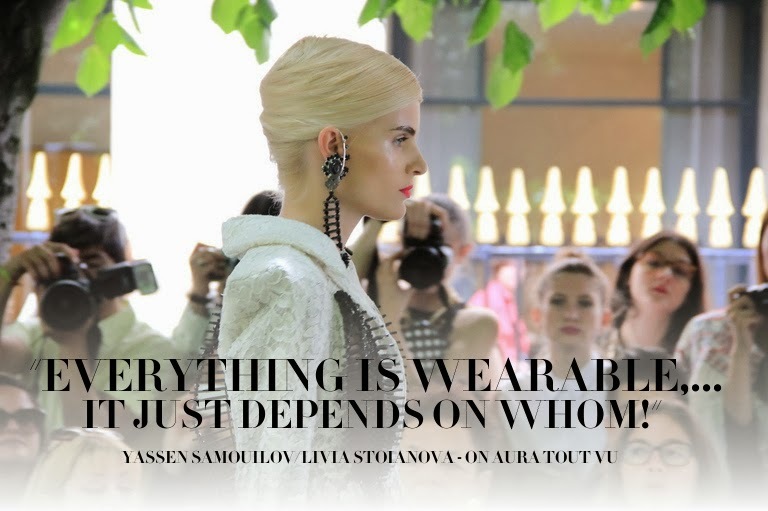 In my struggle to erase a term 'wearable', these quotes coming from dangerous duo Yassen Samouilov and Livia Stoianova of On Aura Tout Vu represent it at its best. Everything, as long as it's ever worn by somebody, is wearable. The astonishing idea and skilful execution to realise a skeleton attached to a jacket with bold silhouette, a skull-shaped clutch, and amazing wedding dress out of plexiglass didn't come up from a commonplace people. 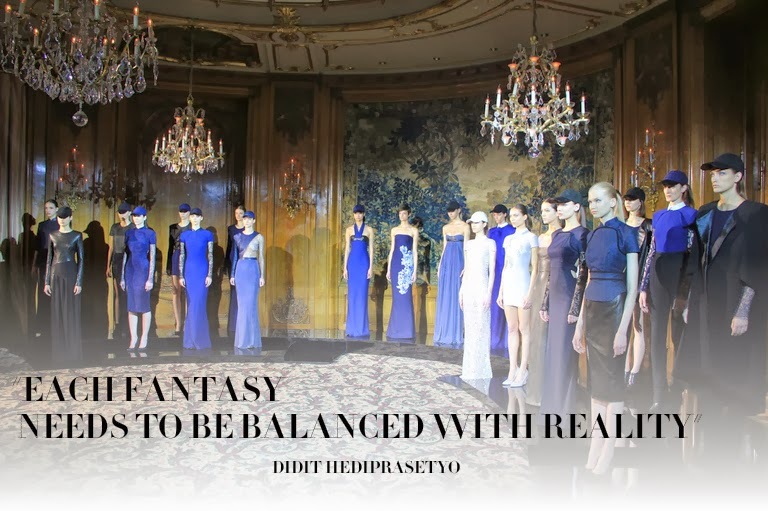 Their imaginative humanbody-praising concept, along with masterful technique, is an awakening realisation that clothing comes from human and for human. Everything is wearable. You can never go wrong in his dress. Never. That's all I can say. Most of the time, when we say art, we directly associate it with million dollar painting hanging or statue erected in a museum and auction houses, or a piece made with long planning and endless process. We sometimes forget, that art is supposed to be approachable, coming from everywhere, including humble places such as streets and daily normal things. Ylan Anoufa has showed me, that art can come from something spontaneous. As he said, "I don't separate art from fashion". Art can be applied and born in fashion. It's just the way how we see it. Oh, Olivier. What a young man with heavy burden of one of the most historic fashion houses of all time. 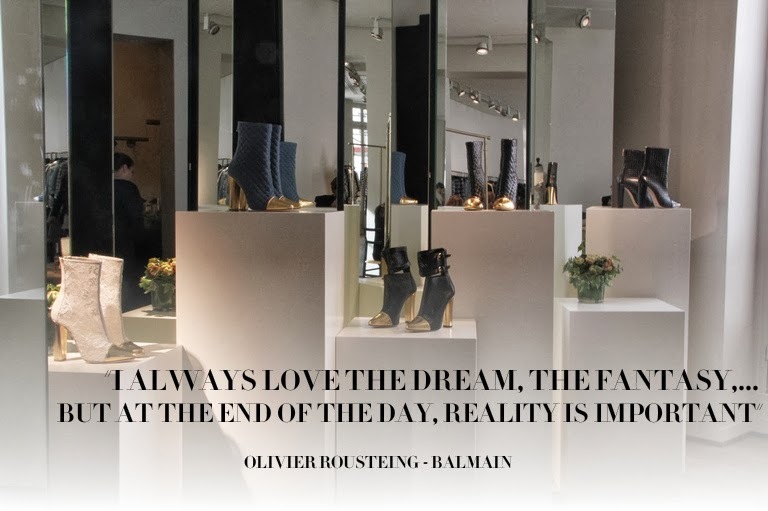 With such and old house with abounding archives and values to preserve, and yet to keep the modern and young spirit alive, Olivier has been doing it very well in such ease. And as what it seems to be a bright joyous future for the brand, what he needs to do is just to keep on going. And keep the crazy price tag on hanging.